Follow the links in the index below to read past COASTING columns. September 15, 2003 I’m a member of our town’s traffic-safety coalition and bike committee. So, the other day I was a bit ruffled to see a woman flaunting every safe cycling practice. She was riding barefoot and bareheaded and steering with one hand. In her other hand she carried a large paper bag dangling precariously near her front wheel. She was riding on the sidewalk approaching one of the busiest intersections in town. As the traffic stopped at the red light, she veered into the street, weaved through the cars; balanced for a second waiting for the right gap in the oncoming cars, and proceeded to cross the road against the light. She made the left turn but took the sidewalk and pedaled out of view. She should have been killed. Yet she avoided all danger like a skilled surfer on a treacherous wave. I’ve been thinking about her a lot and wondering if it was her way of making a statement. Her way of railing against society and its attachment to highways and automobiles. Probably not, but there was something poetic, even magical about how oblivious she was to the traffic and the rules and devices designed to control it. The picture on the right shows the great nameplate I just purchased on eBay. It was getting nearly impossible to find nameplates until this fine resource came along. This badge is a Ben Hur. I have two others in my collection (one identical but without paint and one thats much simpler), but this is the first time I’ve seen one of these hundred-year-old beauties in excellent original condition. My best guess is that it was never installed on a bike, which would explain how it lasted all these years. There are thousands of nameplates out there, but the ones I like best depict historic or fanciful themes. And, you can’t get much better than Ben Hur’s chariot race! There’s hope! Recent reports indicate that sanity may soon be restored on Europe’s roads with legislation pending that will put the onus on drivers to prove their innocence after lethal accidents with cyclists or pedestrians. Today, all drivers have to do to escape penalty is tell the authorities that they never saw the person and the event is swept under the rug as an unfortunate accident with little effort made to defend the victim. That’s crazy. Let’s push for legislation like this here in the US and elsewhere so that drivers are forced to pay attention behind the wheel. The life you save may be your own..
As always I attended the Interbike show in Las Vegas this past fall and found it uninspiring. I miss the fervor of the eighties when exciting new products appeared almost monthly. This year I spotted only a handful of noteworthy things. So, Ive been thinking of the products Id like to see. Feel free to steal these ideas... maybe youll make some money and boost our sport. Replaceable bladders. I dont use hydration packs because keeping them clean is a hassle and using them when dirty makes me sick. We need disposable bladders that you purchase in bulk and toss after a few uses. No cleaning required! Get with the program, Camelbak! A chain cleaner that works. Tall order, I know, but it seems like it would be possible to create a device that snaps on the chain and really cleans it. Todays tools only sort of work. Why not make it leakproof and increase the brushes; maybe include a motor and rechargeable batteries (Makita could do it!) to turn the brushes. Even if the tool cost twice as much as current models, it would certainly sell if it made chain cleaning a no-brainer. And, related to the chain cleaner would be an all-condition chain lube that works. By works, I mean it keeps the chain lubed for a week, or so, and remains clean, whether its used on a mountain or road bike and regardless of riding conditions. Ideally, this lube would be factory installed and provided with the chain. This business of cleaning a new chain is preposterous. Self-centering stems and seatposts. How hard can it be? A simple notch and groove arrangement would do the trick and all the fussing would be over, saving wear and tear on bolts and endless fussing around by home and professional mechanics. Helmets with retractable visors.. Visors are useful because they block glare, which can prevent accidents. But, they can also block your vision when youre riding the drops on a road bike. Thats why most roadies go without (also because the visors cause drag and look funny). The solution is a retractable visor  one that retracts into the helmet when not in use. That way, its not causing drag and making you look like a mountain biker when you're road riding, yet its available when the suns in your eyes. Things have been exciting around here the past few weeks. It all started when a friend brought over an old track bike acquired at an auction. 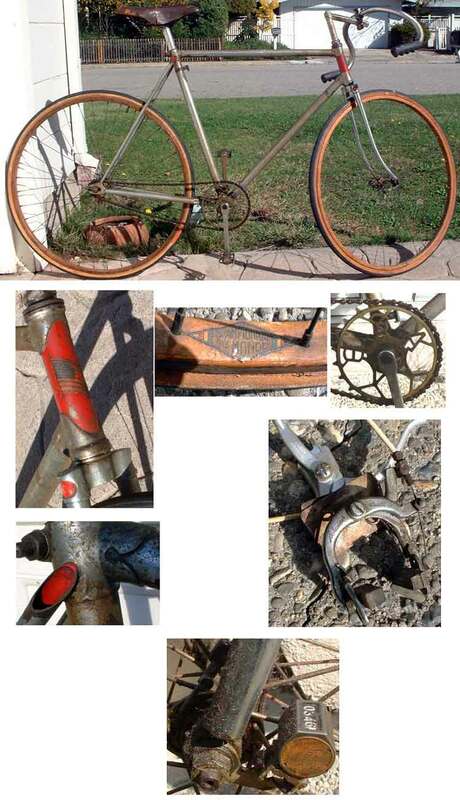 It turned out to be an early Schwinn Paramount, one of the most collectible track bikes due to the Schwinn name and the companys impressive racing heritage. My friend asked me to sell the bike for him on eBay. As soon as it was listed, I started receiving emails from track-bike collectors and famous racers from around the country. I heard from an emailer whose address began with Nothstein. I heard from Jack Simes. A collector named Roman in New York sent photos of his gorgeous 1939 Oscar Wastyn built Paramount. And I got some good information from Richard Schwinn at Waterford Precision Cycles. In the end, the bike remains a bit of a mystery. 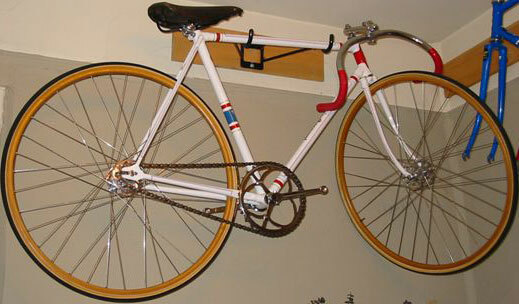 Were not sure exactly when it was built, what the exact finish was and who last rode it. But, its sure been fun owning it for a few weeks. If youve got a bike equipped with reflectors, remove them so they dont fall off and litter the trail. Use a light if you ride after dark. When you come to an obstacle in the trail that you cant ride, dont make a new trail to ride around it! That ticks off rangers and land managers. Instead, walk the obstacle or learn how to ride it by asking friends to show you. While its fun to ride off road in big groups, its best to keep it to only two or three people. The trails are too narrow for large groups and its inconsiderate to hog the trails riding in a big bunch. It also trashes the trails. Whenever possible, bicycle to the trail. Driving just adds another car to the roads ruining cycling for other riders. If you spot trash on the trails, pick it up and carry it out to help keep the trails clean. Speaking of trash, if you find a tube that some fool left trailside after fixing a flat, take it home and recycle it. Usually, you can patch tubes and reuse them. Or, if its damaged beyond repair, it might have a removable valve core that could come in handy. No? You can always use the tube as a non-scratching tie-down for your bike rack. Finally: brake less! Braking causes skidding, which puts ruts in the trails and turns hardpack into powder ruining the surface. Learn to keep your speed under control and to brake lightly like the pros. Over the almost 200 years two-wheelers have been around, no part has been more experimented with than the bicycle seat. Still, even today, with all the amazing designs available, some people cant get comfortable on the seat that came with their bike. Sometimes, changing the seat to one of the popular replacements doesnt help, either. And there are plenty of riders who suffer due to medical problems. To help, Ive added two links in my seats story for innovative new saddles that were recommended by readers. Ive tried the BiSaddle and was quite comfortable on it. It has an amazing range of adjustment and is well made. Dont give up if the first seat doesnt do the trick. You may have to try several to find one that offers you complete comfort. Ive had my share of run-ins with dogs, but I almost got knocked off my bike by a cat today, which is a first for me. He ran across my path when his master called him in for breakfast. I heard the call but didnt see Tabby until I was on top of him. I turned to the left and braked hard or I would have run him over. What strikes me as weird is that the cat never noticed me. He was so focused on his routine that I believe he would have crossed the road even if a car had been passing. The lucky part is that I sensed something was there before I saw it so I had time to veer to the left and watch him brush past my front tire on his way home. Im glad I missed him. And, I think its cool that to the cat I didnt even exist. Ride your bike as often as possible: to work, around town; for exercise and fun. Get your neighbors into biking by offering to tune-up their bikes and by giving them helpful tips. All thats usually needed is air pressure and lube and a little time. Support the bike industry by buying another bike! Theyre cheap compared to other toys and there are so many wonderful types. Get a folder; a city bike, a traveler... try a recumbent or unicyle! Get a tandem  or finally splurge on that dream bike youve wanted for years. You deserve it. Talk about instant karma... my friend was pedaling home last week when a car full of kids crossed the white line and intentionally missed him by an inch. Fortunately, he wasnt hurt. About an hour later, my friend spotted the same car parked in a turnout. No one was around, so he deflated the car tires, hopped back on his bike and headed home, content in knowing that they wouldnt be able to buzz him again. A few miles further, however, he met a policeman who he told about the reckless drivers up the road. The cop took the complaint and drove off to find the kids. That night, my friend heard from the cop. He had found the car and ticketed the driver for reckless driving. Flat tires, a trial, penalty fees, increased insurance, a record.. suppose those slackers will buzz the next cyclist they pass? Check out my new seat, a Selle Italia Evolution SLR. This study in minimalism consists of 2 titanium rails and a razor-thin carbon top. Thats it. Theres no padding and no flex. It weighs only 125 grams and costs about $160. I first saw this beautiful seat at the Interbike bike show in September and knew I had to have it because its so wild looking  like a wing. Its the perfect complement to my superlight Litespeed Vortex, too. How does it ride? In a word: hard. But Im getting used to it. Selle Italia seems to have nailed the shape so that it perfectly matches your anatomy  or at least is so close, that your anatomy can adapt to the seats. Luckily, Im not one to suffer saddle sores often. In fact, Ive told friends who complain about seat pain that I could probably ride on a piece of two-by-four lumber and be comfortable. I always thought I was exaggerating. But, riding this SLR, makes me think I really could ride on any seat. I take a lot of flak from other riders for biking with a Walkman. But, I can explain. I usually ride in the morning and alone. Ive never been able to find a training partner willing to ride at dawn. And, I got bored spinning down the same roads looking at the same scenery. So, about ten years ago, I got a small Sony Walkman AM/FM radio that easily tucks in my jersey pocket. I tried one with a cassette player, but messing with the tapes was a hassle, so I settled on a radio. It has ten station presets. Simply by reaching back and pressing the button, I can go from NPRs Car Talk (my favorite Sunday morning show) to sportstalk radio (yes, they do sometimes mention Lance) to music. The reception where I ride is reasonable so most of the stations come in during even long rides. People think that its dangerous to ride listening to headphones. But, Ive found that if you use earbud models (which tuck inside your ear) and dont crank the volume, you still hear cars way before they pass you. Besides, if like me, you love cycling and music, it only makes sense to experience them simultaneously. Ever dream that youre flying? Its a great feeling that makes you wish you could. But, until the other day, I hadnt experienced this feeling while cycling. Lots of people describe bicycling as the closest humans can get to flying. And bikes have played a significant role in the development of airplanes from the Wright Brothers (they started as bicycle manufacturers and used bike parts on their planes) to Paul MacCreadys amazing pedal-powered airplanes. But, while you can certainly speed downhill and swoop around corners on a bike, youre always touching the ground, connected, not totally free, as you would be flying. But, I realized recently, that your mind can trick you and provide the perfect out-of-body, real-time flying feeling. All it takes is ultra-smooth pavement, a long downhill, no distractions and complete relaxation. On the right road, on the right day, in the right frame of mind, the bicycle disappears and its just you, flying along the road. A little over a year ago I purchased a DVD player so that we could really enjoy movies at home. The improvement in picture and sound quality over videotapes is impressive. And DVDs often inclue special features, such as documentaries about the making of films, outtakes, or the history behind the story. Another great thing about DVDs is that theyre affordable, small and durable -- perfect for collecting. Also, its possible to request unavailable titles on Amazon dot com and they send the requestes to the DVD manufacturer and then let you know when the movie becomes available. I plugged in my wish list: The Treasure of Sierre Madre, If, From Here to Eternity, The Bicycle Thief and Breaking Away. Im still waiting for most of these, but Im delighted to report that one, Breaking Away is now available, and at the ridiculous price of $15, or so. If youre into DVDs and havent seen this film, buy it today. Its a wonderful movie. I know the answer to this question, but Im going to ask it anyway: Why do you think glue tubes in patch kits are so tiny and porous? If the tube was air tight and held more glue, thered be a much better chance that thered be some sticky stuff in there when you desperately need it. You know, that rainy day when you pop a tube, install your spare and discover to your disgust, that the spares popped, too. This is usually when you find that the glue tube, though it appears full, is completely empty -- the cement having evaporated probably hours after your last repair. Argh! This means hoofing it, or hitching home, and forces you to buy a new patch kit way before you need one (there are always plenty of patches remaining because you probably only got one repair out of the tiny tube of glue). Well, wouldnt it be a lot better if patch kits had glue tubes that held some glue and didn't let it evaporate?! And why not make the tube refillable, so you can buy glue in bulk to keep the patch-kit glue container full?! At the risk of sounding like your mother, Id like to take a moment to talk about helmets. Wear one, wouldya? And dont take it off and drape it on your handlebars when youre climbing a hill. Thats ridiculous. Todays helmets weigh next to nothing, are riddled with vents and are so comfortable, you forget you have them on only minutes into the ride. If thats not the case with yours, I recommend heading to the shop and purchasing a Giro Pneumo. (Or, if its too expensive, try on more affordable models with similar features.) If you havent tried the new lids, I think youll be amazed. The Pneumo is the same helmet worn by many of the pros in the Tour this year. It didn't hold them back and it wont hold you back, either. More importantly, itll save your life if you fall. And, always remember, it's not the speed that kills you; its the fact that on a bicycle, your head is seven or eight feet higher than the pavement. Get flipped over the bars and its even higher. Thats a serious impact when your head strikes the ground, even if youre crawling uphill. Get a good helmet and wear it when you ride. Ive been thinking a lot about trucks lately because theyre everywhere. Seems theyre faster, larger and louder than ever. Seems truck drivers are less courteous, too, passing too closely, speeding, tailgating -- like the brain-dead blonde in the white Toyota on Sunday who nearly pancaked me passing on the shoulder. Dont these people realize that trucks arent cars? Theyre much more dangerous and a far greater threat to other road users than the average car. It makes me dream about restricting trucks somehow. Wouldnt it be great if they suddenly couldnt exceed 50mph  or how bout 45mph? If laws were passed that made it incredibly costly to insure a vehicle with double wheels in back? If they really enforced those pollution laws were supposed to have? If on certain roads trucks were banned outright? Hey, maybe you should have to pass a test and get a special license to drive a truck? I wont hold my breath, but measures such as these would sure help.